Signs on the former Hometown Pharmacy building announce that a new ice cream shop will soon open there. Kim and Bob Curlis, who owned the pharmacy, are fulfilling a family dream by starting the sweet treat business. SIDNEY — Every local ice cream lover will have a new place in which to indulge his sweet tooth come March. Kim and Bob Curlis, former owners of the Medicine Shoppe/Hometown Pharmacy here, will open K&J’s Ice Cream in the building that used to house the drug store at 130 W. Russell Road. They hope to be scooping out cold treats by late March. The K in the name stands for Kim and the Curlis’s three daughters, Kayla, Kelly and Katelyn, and the J stands for the Curlis’s son, James. James and Kim’s stepfather, Renny Smith, are also partners in the business, which has been a family dream for some 10 years. Running their own shop was something that came up in conversations every so often through the years. “We always talked about how we should open an ice cream store, but with the pharmacy, it was too much. So this was our pipe dream,” Curlis said. Friends who “knew them when” are excited that the dream is coming true. “You guys are really doing it,” they enthused. Curlis said she has never worked in ice cream, but Kayla and Kelly have. James is studying for a business degree. “He’s coming on to help out on the business side,” Curlis said. The group has done extensive research, talked with nonchain, ice cream shop-owners in other cities and attended ice cream trade shows. They got advice from equipment vendors and users. “‘Don’t buy used equipment,’ they told us. Your ice cream is only as good as your equipment, because if it doesn’t freeze right, it affects your flavor,” Curlis said. They also tapped other family members for help. Smith’s niece, Kitt Horn, of Wapakoneta, and his sister, Linda Turner, of Waynesfield, stopped in Thursday with curtains for the front windows. It didn’t take long for the women to get into a conversation about how best to cover the valance of the existing blinds. “I could just take a 6-inch wood piece …,” Horn said. Curlis has already put in tables, chairs, freezers and other furnishings. A colorful painting of a cow hangs on one wall, a hint of decorative touches to come. “We can’t put in the counter tops until the plumbing inspection is done. And they can’t inspect until the rest of the plumbing is installed. So we’re a little backed up,” Curlis said. She estimated that the investment to turn the former pharmacy into the ice cream store will total $100,000. “A community is only as good as what’s invested in it. We’re in a wonderful community. Owning a business is the American dream. We did that for 22 years. It was hard to let go of that,” she said. 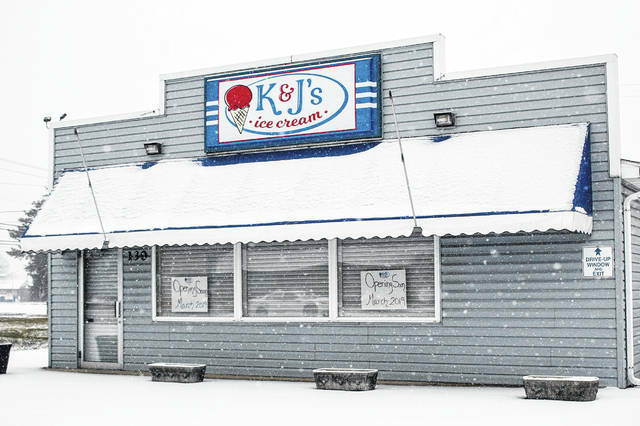 Plans call for K&J’s Ice Cream to be open seven days a week from March through October each year. Customers will have a choice of 24 flavors; although Curlis wasn’t ready to announce what brand of ice cream the shop will carry. “I’ve tried every ice cream in a three-county area,” she laughed. “I want something different from what you can already get here.” She knows whatever brand she chooses, sugar-free options and dairy-free Dole Whip will be among what’s offered to customers. They’ll be able to enjoy all the standard ice cream shop items: cones, sundaes, malts, milkshakes, cyclones, floats. And the store will sell hot dogs and shredded chicken sandwiches, eventually. “The advice we got to be successful was ‘Stay in your lane. Don’t start frying.’ You can’t offer everything all at one time, or you’ll fail. Our focus is ice cream. We want to have a great ice cream product,” Curlis said. She will, however, sell bottled Coke products and coffee. “My grandma always would go for a sundae — and a cup of coffee — with her friends. So I have to have coffee, but it will be traditional coffee, not fancy coffee drinks,” she said. There will be seating inside and outside and a drive-through option. Family members will comprise most of the staff, but Curlis will hire some additional part-time employees. Former pharmacy employees and customers have already applied. “I’ve felt really fortunate. I have a nice stack of applications, and I didn’t even post it,” she said. https://www.sidneydailynews.com/wp-content/uploads/sites/47/2019/01/web1_ice-cream-shop-1.jpgSigns on the former Hometown Pharmacy building announce that a new ice cream shop will soon open there. Kim and Bob Curlis, who owned the pharmacy, are fulfilling a family dream by starting the sweet treat business.